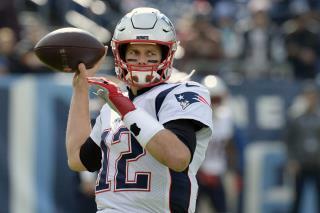 (Newser) – Despite a bout of illness this weekend, Tom Brady manages to lead one of the NFL's most fearsome teams—maybe because he knows what to avoid. The New England Patriots quarterback opened up about his fears when taking questions from California firefighters during an interview earlier this week, 247 Sports reports. Asked which defensive player he has feared most over 18 NFL years, Brady didn't hold back: "There's been a lot of them. You know what the problem with those D-linemen is? They’re all faster than me, because I'm pretty damn slow." I would think it would be he and his lowlife team get caught cheating again and really punished this time. 2 of those ill_gotten bowl rings should have been taken away and their wins stricken. I thought his nightmare was having to work a real job for a living. So his nightmare about being sodomized by a moose doesn't rate anymore?